I wrote Everyone Leads to share my leadership journey and the lessons we at Public Allies learned from 20 years of developing young adults from all backgrounds to be effective leaders. 100% of proceeds from Everyone Leads support Public Allies. Click here to purchase a copy. “Pluralistic Leadership” by Darell Hammond, CEO of KaBoom!, Stanford Social Innovation Review, Spring, 2012. Read full review here. Where is the leadership we need to solve our most pressing community problems? It’s all around us. 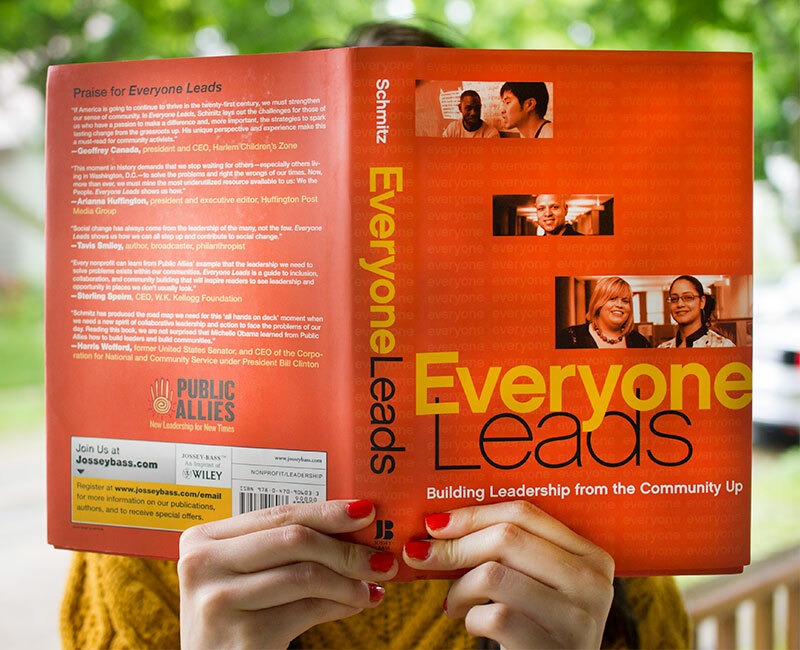 Everyone Leads: Building Leadership from the Community Up will inspire readers to see new leadership possibilities within themselves and their communities. It also offers a set of practices that will help leaders be more effective at bringing diverse people and groups together to solve problems. Many leadership books today focus on how to lead organizations; this book is about how to lead communities. Paul Schmitz, the former CEO of Public Allies, shares the experiences and lessons his organization learned from two decades of finding and developing thousands of young leaders across the country. The book is organized around a new definition of leadership: (1) It is an action everyone can take, not a position few hold; (2) it is about taking personal and social responsibility to work with others on common goals; (3) it is about practicing values that engage diverse individuals and groups in collaboration. Not everyone can lead in every context, but everyone has the capacity to step up, take responsibility, and work with others on shared goals. The author uses inspiring stories and practical examples to demonstrate what it means to lead today. He describes the emergence of Public Allies’ leadership model (and the important role played by Michelle Obama, who left a prestigious legal career to found Public Allies Chicago) and demonstrates its impact through the experiences of young leaders it has nurtured – such as the deli worker who now runs a disability rights organization, the single teen mother in community college who is now a White House lawyer, and the former gang member who graduated from college with honors and now leads a job training program. Schmitz also describes his own journey as an aimless and delinquent youth to a national nonprofit leader and Presidential advisor. The book surveys America’s democratic and civil rights history, current events, and leadership theory to demonstrate how collaboration among citizens has always been core to social change. It outlines five leadership values essential today: diversity and inclusion; teamwork and collaboration; recognizing and mobilizing assets; continuous learning; and integrity. Everyone Leads offers a hopeful path for citizens, policy makers, and nonprofit organizations who want to build and engage the diverse leadership our communities and our democracy badly need. Social change has always come from the leadership of the many, not the few. Everyone Leads shows us how we can all step up and contribute to social change. We have long admired how Public Allies discovers one of our community’s most untapped assets: young people, especially those not often seen as potential leaders. We hope many more will join them in building these assets. This moment in history demands that we stop waiting on others — especially others living in Washington, D.C. — to solve the problems and right the wrongs of our times. Now, more than ever, we must mine the most underutilized resource available to us: We the People. Everyone Leads shows us how. If America is going to continue to thrive in the 21st century, we must strengthen our sense of community. In Everyone Leads, Schmitz lays out the challenges for those of us who have a passion to make a difference and, more importantly, the strategies to spark lasting change from the grassroots up. His unique perspective and experience make this a must-read for community activists. Schmitz has produced the roadmap we need for this ‘all hands on deck’ moment when we need a new spirit of collaborative leadership and action to face the problems of our day. Reading this book, it is no surprise that Michelle Obama learned from Public Allies how to build leaders and build communities. Everyone Leads challenges leaders and organizations to think in new ways about how we lead. It calls on us to see our effectiveness not just in the achievement of goals, but in the values we practice and the people we engage as we achieve them. Schmitz has issued a call to action well worth heeding. Bravo!